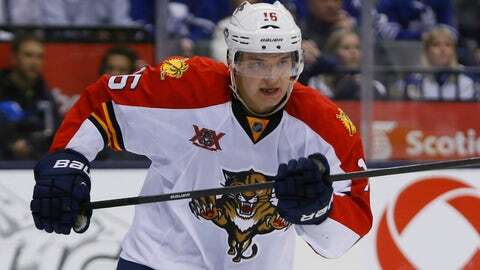 Panthers rookie Aleksander Barkov has played for the Finland Under-20 national team in two World Junior Championships tournaments. Ask anyone in the Florida Panthers dressing room about rookie Aleksander Barkov and they will share the same anecdote: The Finn is quiet. Very quiet. Not so much when it comes to national pride, especially with gold on the line. "It’s a big rivalry. It always has been," Barkov said. "We hate Swedes, and Swedes hate us." If the 18-year-old was not in the midst of a strong rookie campaign with the Panthers, he might have competed with the Finnish Under-20 team at this year’s World Junior Championship. But he offered his support via Twitter when his countrymen advanced to the title game against host Sweden, remarking in what translates to "Go Finland." It is a pretty big deal for Finland, which has not medaled at the tournament since 2006, when it won bronze. The nation last won gold in 1998. Panthers teammate Jacob Markstrom, a Swede, was quick to chirp back, adding a hashtag, "Come on Sweden." Barkov and Markstrom are alumni of the tournament, which tends to garner much attention outside of the United States. Barkov competed in the event in 2012 and 2013, recording five goals and nine assists in 20 games, though he never medaled. Markstrom also competed twice, posting an 8-2 record in 10 games. He captured a silver medal and Best Player honors in 2009 and a bronze in 2010. Including the World Championship and Olympics, the Nordic neighbors have played for gold six times, with Sweden winning four of those meetings. But it was Finland who came out on top this year, winning 3-2. "When I played, I always hated the Swedes," Barkov said, grinning. "So its always nice to beat them."